“For most of us, this DVD by Ozzie Ozefovich, will provide a highly informative view of the world through the trout's window—a view that we all need to understand, but one that few have seen. Be certain that you see this DVD, it will make you a better angler“. “Not just trout fishermen but any fly fishermen stalking fish (bonefish, redfish and more) should buy and absorb what Ozzie has so well presented“. Every angler knows the frustration of lining a fish. After finding that big fish actively feeding, we make a cast where we think it should be, and — quick as a flash — it’s gone. What you forgot about was the law of refraction. That fish wasn't quite where you thought it would be. You thought it was six inches below the surface. But how deep was it, — one foot, two feet, — or was it deeper? How large was it’s “circle of vision”, and does it matter? Sound confusing, well it’s surprisingly easy once you understand what is happening. 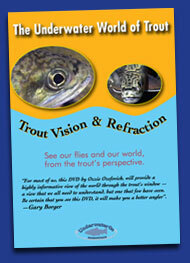 Refraction has an impact on how we view a trout and its world, and conversely how a trout views us and our world. Do trout really have blind spots? How low must you be before they are aware of your presence? Does it matter what you wear and how you move? You’d be surprised at the little things that will put a trout down. We’ll watch through a trout’s eyes how mayflies and tricos float into the trout’s window — and see what the trout sees first. We’ll see that “imprint”, and the “sparkle” that you only read about. Most important of all, we will also see that “magnification of the fly” that takes place as the fly enters the trout’s window – something you may have never read about. Why are comparaduns and parachute flies so effective — does the reflected double image of a streamer, a wet fly, or an emerger cause a trout to miss? How well can trout see both above and beneath the surface? In this third installment of The Underwater World of Trout, we explore why what you see isn’t what the trout sees. More importantly, you’ll learn to interpret what you actually see to better understand what really is happening under the water.